Hi there! 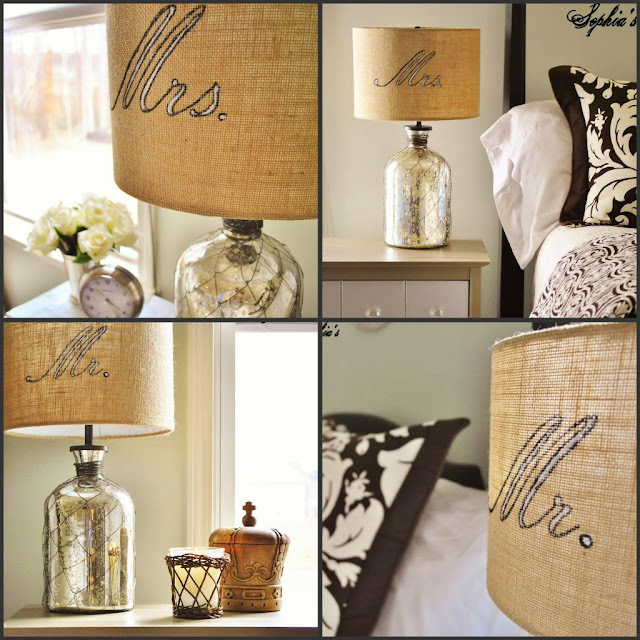 I'm Kristen from Sophia's Decor and I'm so happy to be sharing my favorite room here at Savvy Southern Style. Kim is such a talent and her blog has been such an inspiration for me since I started blogging. She truly has an eye for design! I'm a busy mom of three girls and I really love to have a comfortable place to escape and relax at the end of the day. I also picked up some $20 thrift store chairs and painted and re-upholstered them in clearance velvet curtain panels from Target. Since I've always wanted a pair of mirrored nightstands, but are not currently in the budget, I simply re-painted our old ones with some silver metallic paint and added new glass hardware. Since the kids love to come in our room to watch a little TV or movies, my husband and I built this bench for them last weekend. They love it! The house didn't come with a fireplace in the room so I added one of my own! It's a fun way to add a little character to a room. It's been a fun process to put the room together and I personally love that I didn't have to break the bank to get the look that I wanted. Thanks so much for visiting my favorite room today and thanks Kim for asking me to share! 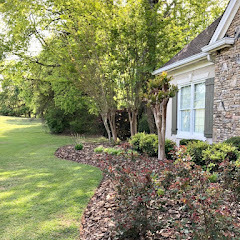 If you'd like to see more of my home, you can visit my home tour here. Have a wonderful day! Thanks so much, Kristen for sharing your stunning master bedroom. I had the honor of meeting Kristen at the Southern Blogger's Conference back in October. 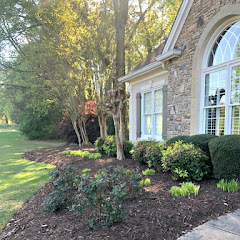 Alright y'all, go on over to Kristen's and look at the rest of her beautiful home. Get comfy first because you may be there for a while. Beautiful room and the whimsical touch of the chalkboard fireplace is perfect! Kristen's home is magnificent...She is so very talented...I am always so totally amazed at her ability to find such wonderful pieces for such great prices and she beautifully transforms them to works of art! !...As you tour her home...you can definitely see her personality....of beauty inside and out!! Thanks again for asking me to share my favorite room! Have a wonderful weekend Kim! Just gorgeous, I am loving that diy fireplace, so cozy and cute. Thanks for sharing Kim! Kristen has done a wonderful job on her lovely bedroom. My favs in the room are the made-to-look-like mirrored nightstands (so clever), the Mrs. & Mr. lampshades, and the chalkboard fireplace with the plush fur rug. Thanks for sharing Kim! Such a beautiful room. I love the lampshades and the overall elegant feel. Love the room and all the creativity! What a beautiful bedroom! I love that she used discounted velvet curtains to recover those chairs. They turned out gorgeous! I love Kristen's entire house! I think my favorite element in this room is the cool fireplace, but it's all gorgeous! Love love Kristen's beautiful bedroom, it should be in a magazine!! Heck I love her whole house! Love, love love this bedroom! So much inspiration here. I'm in awe. Thanks for sharing her! Such a BEAUTIFUL room!! Perfect to relax in at the end of the day. Love the chalkboard fireplace! Very clever!! Oh wow, what a stunning bedroom, with athe chalkboard fireplace and all!! I need to do my completelly over...so thanks for the inspiration! What a beautiful bedroom she has created. I love the fireplace mantel and chalk drawn fire. She's very talented! I am in love with your chalk board fireplace! I don't have a fireplace in my home either so I have been thinking of doing something like this. You did a great job! Hi, Kim and Kristin - So many wonderful ideas here! Kristin, your master bedroom is like a retreat....so warm and stylish. You've shown what a little paint can do for furniture. And as someone specializing in Swedish painted antiques, I love it! 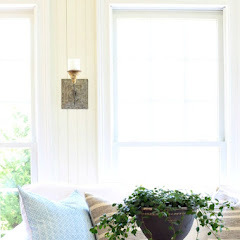 I so love Kristen's calming color scheme throughout her home. 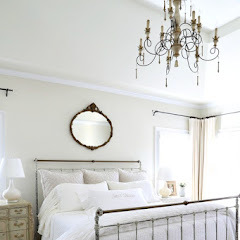 What I think I love the most about the bedroom (besides the chandelier, velvet chairs and her childhood dresser!) is the layering she did with the furry rug in front of the faux fireplace and the throws and layering of bedcovers on her bed. 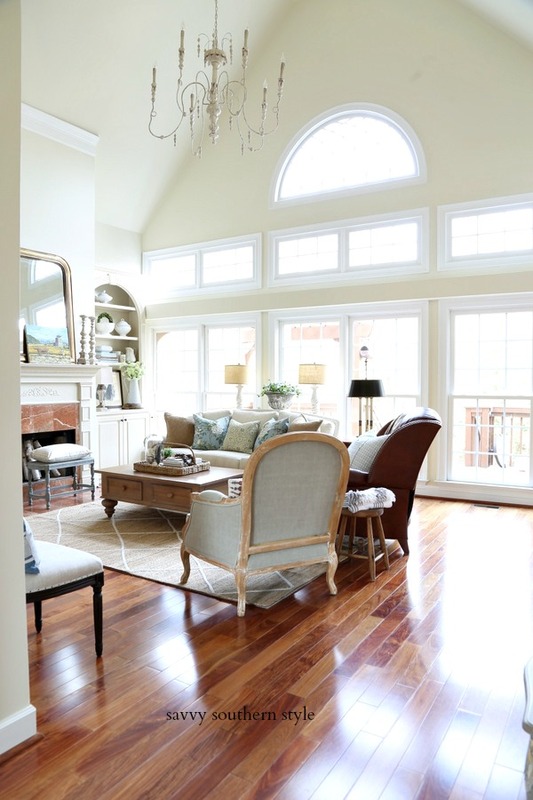 Those layers warm up the space so much and make it a "home". Lovely. Your bedroom is certainly beautiful and inspiring new ideas. Love it! Beautiful bedroom. I like the wonderful mix of browns and patterns. Always amazed at what others find on Craigslist. That is a beautiful bedroom. So so pretty. Kristen's bedroom is stunning. 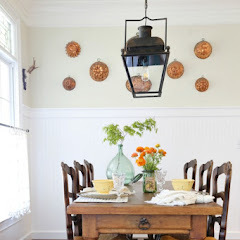 I love all of her home and her wonderful style! I'm so happy to be able to count her among one of my friends. Thank you for featuring her favorite room, Kim. Wow, she did a great job with all of the furniture makeovers. I'm impressed! Kristin's bedroom is stunning! All of her special touches make it a perfect getaway at the end of the day. I love everything about this room - everything! You've done a beautiful job with some very clever accents I wouldn't mind copying! My husband is a builder, and so we see many spec houses, sometimes after the homeowners have moved in... years later they still look very cold and un-homey. You've got the touch! 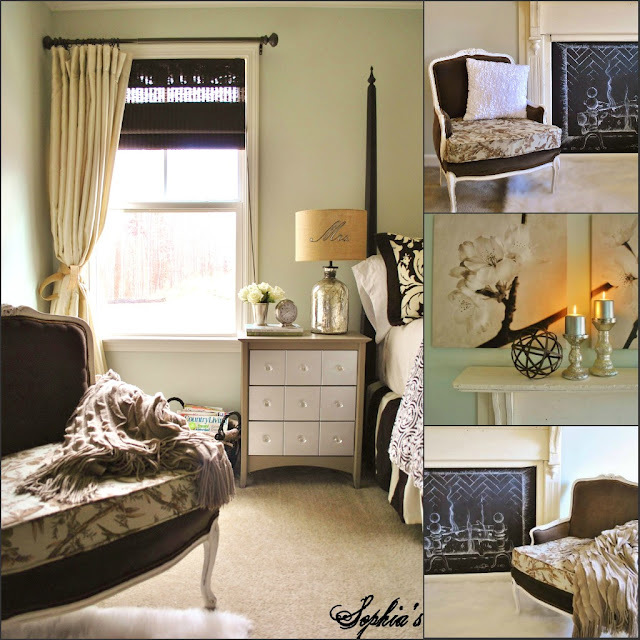 Kristen did such a great job creating a comfortable and elegant room on a budget...got LOVE that! I'll visit the rest of the house, of course! You are a designer for sure.....many great choices and ideas, very clever! I love how she redid the childhood dresser. Now it looks very unique and elegant. It caught my eye right away.